Currently, its role is to contribute long and short range reconnaissance and sniper assets to the combat brigade and division level and to locate, gather intelligence, engage and kill the enemies of the United States. The mustering, organized by Maj. Francis Moore, 65th U. S. Colored Infantry, formed the nucleus of the enlisted strength, and was obtained from New Orleans and its vicinity. In the autumn of 1866 recruiting began in Kentucky, and all the men of the 9th were obtained from that state and Louisiana. The horses were obtained at St. Louis, Missouri. About the middle of September all recruits were assembled in New Orleans, where empty cotton presses were used as barracks. An epidemic of cholera caused 29 soldiers' deaths between October and December, with 46 other soldiers deserting by the end of March 1867. The camp was moved to Carrollton, a suburb of New Orleans. Officer positions did not begin to be fully staffed until February 1867. By the end of March 1867, the 9th Cavalry was at nearly full strength with a total of 885 enlisted men, or an average of over 70 to a Troop, and was ordered to San Antonio, Texas, where it arrived early in April for three months of training. However, Troops L and M went directly to their duty station at Brownsville, Texas. In April 1867, violent altercations between officers and soldiers occurred in Lieutenant Edward Heyl's Troop E and Lieutenant Fred Smith's Troop K near San Antonio as a result of poor morale and poor leadership. Sergeant Harrison Bradford and Lieutenant Seth E. Griffin died and 10 soldiers deserted from E Troop. The soldiers at this point still had not been introduced to the Articles of War, and so two soldiers convicted to death were pardoned and restored to duty. In July 1867 the 9th Cavalry was ordered to western and southwestern Texas, to maintain law and order between the Rio Grande and Concho Rivers along a 630-mile line with seven forts from Fort Clark to Fort Quitman near present day El Paso (the forts ended up including Fort Quitman, Fort Davis, Fort Stockton, Fort Lancaster, Fort Clark, Fort Duncan, Fort McKavett, and Fort Concho). Regimental Headquarters and Troops A, B, E and K, under Col. Hatch, were stationed at Fort Stockton; Troops C, D, F, G, H and I, under Lt. Col. Wesley Merritt were at Fort Davis. Troops L and M under 1st Lt. Hamilton had previously been sent to Brownsville. The 9th remained in Texas for eight years, nearly all of it in the field. While in Texas, the troops battled intermittently with Apaches, Kiowas, and Comanches, escorted mail, and rescued civilians from native populations. On December 26, 1867, K Troop lost three troopers at Fort Lancaster by an estimated force of 900 natives and outlaws. The regiment went to New Mexico Military District, which covered parts of New Mexico, Colorado and Texas, and participated in the Apache Wars from 1875 to 1881. Headquarters were at Fort Union. While in New Mexico, duties included constructing barracks and stables, caring for the horse herds, scouting for hostile natives, escorting the mail, surveying uncharted land, and constructing roads. That service also included the Battle of Tularosa with Chiricahua Apache warriors led by Victorio in May 1880. The regiment was also patrolled during the Ghost Dance War with the Sioux around the time of the Wounded Knee Massacre and were the last regiment to leave the Pine Ridge Reservation in the Winter of 1890-1891 following the massacre. The 9th and 10th cavalry in the Battle of Las Guasimas, Cuba, 1898. In 1898, the 9th US Cavalry Regiment fought alongside Theodore Roosevelt's Rough Riders at the battles of Kettle Hill and San Juan Hill. Later, they served as his honor guard during his visit to San Francisco. In 1899 and again in 1904, the 9th Cavalry patrolled Yosemite National Park joining other cavalry and infantry as the first "rangers" of the park system. 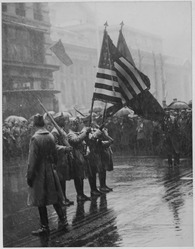 Under General John J. Pershing, the regiment fought in the Punitive Expedition against Pancho Villa in Mexico in 1916. The regiment spent World War I in the Philippines. From 3 April 1921 to 11 October 1922, Brigadier general Edward Anderson commanded the regiment. On 1 March 1933, the 9th Cavalry was assigned to the 3rd Cavalry Division. On 23 March 1907, the United States Military Academy Detachment of Cavalry was changed to a "colored" unit. This had been a long time coming. It had been proposed in 1897 at the "Cavalry and Light Artillery School" at Fort Riley, Kansas that West Point cadets learn their riding skills from the black non-commissioned officers who were considered among the best. The one hundred man detachment from the 9th Cavalry served to teach future officers at West Point riding instruction, mounted drill and cavalry tactics until 1947. The 9th Cavalry was relieved 10 October 1940 from its assignment to the 3rd Cavalry Division and transferred to the 2nd Cavalry Division for deployment in the Second World War. However, the regiment did not serve in that war as a unit. It was transferred to the Mediterranean to supply soldiers for other units. It was therefore inactivated 7 March 1944 in North Africa. The then-experimental 1-9 Air Cav ushered in a new era of combat called, air assault. These teams were composed of aero-weapons (Reds), aero-scout (Whites), and aero-rifle (Blues). Together, ground and air reconnaissance teams patrolled the Vietnam countryside in search of the enemy. Once located, the infantry (Blues) would insert (and extract) via helicopter or foot to engage the enemy with support of their aero scouts and aero weapons. These teams earned the nickname of "Headhunters." This concept differed from conventional front line warfare typical in prior land warfare. During the Vietnam war, the 1st of the 9th Cavalry earned 3 Presidential Unit citations and 5 Valorous Unit Citations. It was inactivated on 26 February 1973 and was one of the last conventional units to leave Vietnam. In 1971, as the 1st Cavalry Division began redeployment to the United States, F Troop, 9th Cavalry was formed from one platoon each from the 1/8 Cavalry, 2/5 Cavalry, 1/12 Cavalry and 1/7 Cavalry. This unit operated independently of the 1/9 Cavalry. On 1 February 1974, Troop C, 9th Cavalry (not 1/9 Cavalry) was reactivated as an armored cavalry troop assigned to the US Army Reserve, assigned to the 157th Infantry Brigade (Mechanized). Initially activated in Bristol, PA, on 31 January 1966, it was later moved to Wilkes-Barre, PA. The troop continued to serve with the 157th Infantry Brigade (Mech) until deactivation on 20 August 1995. The 2d Squadron, 9th Cavalry was assigned to the far end of the runways at Hunter Army Air Field (HAAF) under the command of LTC J. Longhofer as an Air Cav Unit (under the 24th Infantry). In 1977 D-Troop under the leadership of Cpt Maldonado and Medal of Honor Recipient Frank D. Miller attended the Jungle Operations Training Center program at Ft.Sherman, Panama Canal with one medic from the HHT. In 1977 the HHT, A-Troop, B-Troop were moved 40 miles away to Ft Stewart where it was re-designated as an Air and Armored Cavalry. D-Troop remained at HAAF during this time. While D-Troop maintained the Rotary Wings Aircraft and Cavalry Recon Scouts (Airmobile – Air Assault group), A-Troop was given APC's armored personnel carriers and B-Troop had many of the larger track vehicles. HHT had APC's for the medical section and S1-S3. The medics continued to maintain two gamma-goats, but received two new APC's – one 577 command track and 113 ambulance. During this time, Maj Gen Vought was replaced by BG Marine as Commander of Ft. Stewart Georgia. After Vietnam, the Squadron returned to Fort Hood, Texas with the rest of the 1st Cavalry Division and served as divisional recon squadron until 16 October 1986, when it was inactivated. On 25 November 1992, the 1st Squadron, 9th Cavalry was reactivated, reorganized as a mechanized infantry battalion, re-designated as the 1st Battalion, 9th Cavalry and assigned to the 1st Cavalry Division as part of the 3rd Brigade. The 2d Squadron,9th Cavalry, assigned to the 7th Infantry (Light), deployed to Panama (Dec 20, 1989 – Jan 31, 1990) in order to conduct combat operations during Operation Just Cause and the ensuing humanitarian and nation building mission Operation Promote Liberty. The Air Troops were the first to deploy with their AH-1 Cobra attack helicopters and their OH-59 (OH-58 Kiowa) aerial scout helicopters. D Troop,2-9th Cavalry soon followed and conducted route clearance, zone reconnaissance, and provided support to U.S. Army units in the interior. The D 2nd Squadron, 9th Cavalry was station in Warner Kaserne Munich Germany 1962-1968 and Reforged to Ft. Riley Kansas in 1968. 1-9 Cavalry was a rapidly deployable infantry unit of action which deployed abroad several times in the decade; to thwart aggressive and hostile maneuvers of the Iraqi Army. Most notably in Operations Intrinsic Action and Iris Gold. 1/9 Cavalry was designated as the military operations in urban terrain (MOUT) unit of the 1st Cavalry Division. Following is a brief rendition of significant events during this time period. Three soldiers killed on Lone Star North Range. Intrinsic Action I deployment to S.W. Asia. Claymore mine accident severely injured a 1st lieutenant from Company A.
Cambrian Patrol (special operations competitive patrol in England) set range live fire record (Company E). Two soldiers from Company E killed. Two soldiers from HHC killed. Soldier injured by grenade blast at tire house. Intrinsic Action II deployment to SW Asia. Today, the units of the 9th United States Cavalry Regiment provide RSTA (reconnaissance, surveillance, and target acquisition) capabilities forward of enemy lines and supply infantrymen as sniper and long range surveillance teams for use as special reconnaissance in the area of combat operations. These small Army reconnaissance units, provide valuable real-time intelligence about an enemy nation, including its leaders, combat capabilities etc. Gathered intelligence Information is fed into various intelligence agency assets and databases including the national target base. The 9th United States Cavalry units fought against both the armed conventional and unconventional enemies in the decade-long "Global War on Terror" in both the Afghanistan and Iraq theaters. They developed and tested many new military doctrines and tactics when searching for, locating, observing and destroying the insurgent enemy and their war fighting assets, just as they had during the Indian, Spanish-American and Vietnam Wars. The unit has received numerous Presidential Unit Citations and Valorous Unit Awards as well as decorations for individual valor have been awarded to the 9th United States Cavalry Regiment and her combat soldiers. Troop B ("Bloody Knife"), 9th Cavalry, 3rd Brigade, 4th Infantry Division, was deployed from Fort Carson, Colorado, to Iraq in April 2003. After arriving at Camp Wolfe, Kuwait the unit moved to Camp New Jersey in Northern Kuwait. The lead elements of the Brigade Reconnaissance Troop (BRT) then crossed into Iraq, covering a distance of over 300 kilometers. This combat operation was the first for the 4th Infantry Division since Vietnam. The BRT has operated in Samarra East Airfield, Samarra, Ad Dawr, Tikrit East, Tuz Khurmat, Jalula, MEK, Daquq, Kirkuk, Taza Khormatu, Al Huwayjah, Ad Duluyah, At Tarmyia, Ad Dujayl, and Balad South. On 23 October 2003, the soldiers of Troop B/9th Cavalry were issued their combat patches (e.g., the authorization to wear the division patch on the right shoulder) for conducting combat operations in support of Operation Enduring Freedom and Operation Iraqi Freedom. The troop consisted of two platoons of scouts and one platoon of COLT (Combat Observation Lasing Teams). The unit deployed under the command of CPT William Sachse and redeployed under the command of CPT Clinton Fuller. The Bloody Knife Troop became the quick reaction force for one of the largest logistics bases in Iraq while still conducting operations where ever the brigade needed them. The Bloody Knife Troop was one of the last reconnaissance troops to fall directly under a brigade headquarters. The 1st Squadron, 9th Cavalry Regiment (1-9th Cav), is stationed at Fort Hood, Texas, as an armored reconnaissance squadron of the 4th Brigade Combat Team, 1st Cavalry Division. Originally part of the 3rd BCT at Fort Hood, the "1st of the 9th" moved to Fort Bliss to fill the RSTA (reconnaissance, surveillance, and target acquisition) needs of the newly created 4th BCT in October 2005. The unit is nicknamed the "Headhunters". The unit was featured as the command of LTC Kilgore in the movie Apocalypse Now. The 1st Squadron, 9th Cavalry Regiment (1-9th Cav), began deployment to Iraq in September 2003 in support of Operation Iraqi Freedom. Headquarters & Headquarters Troop (HHT) and Troop C, 1-9th Cav were assigned an Army National Guard infantry unit (Company C, 1st Battalion, 153rd Infantry, ARNG), a combat engineer unit (Company A, 8th Engineers), a support unit (215) and a civil support unit to comprise Task Force 1-9 (TF HEADHUNTER). Companies A and B, 1-9th Cav, were assigned to other task forces in Iraq, notably Task Force All American (TF-AA). During their first deployment, 124 Purple Heart medals were awarded to Task Force 1-9 soldiers, who operated in one of the most dangerous sections of Iraq, including the 2004 Battles of Sadr City and Haifa street. In October 2006, the 1st Squadron, 9th Cavalry Regiment, began its second deployment to Iraq from Fort Bliss, Texas, in support of Operation Iraqi Freedom, along with the rest of 4th Brigade Combat Team, 1st Cavalry Division, to work alongside units of the 25th Infantry Division to comprise Task Force Lightning. The Area of Operations for 1-9 CAV during the 06-08 OIF rotation was Mosul, Iraq in the Nineveh Province. After a seven-month duration of operations 1-9 CAV conducted an intra-theater deployment from Mosul to Tal Afar replacing 3/4 CAV for eight months to complete a 15-month rotation. In March 2008, 8th Squadron, 10th Cavalry of the 4th Infantry Division was reflagged as the 1st Squadron, 9th Cavalry, part of the 4th Brigade Combat Team, 1st Cavalry Division. In June 2008, 1-9th Cav deployed to OIF 08-10 to CSC SCANIA and assumed responsibilities for MSR TAMPA and the cities of Hamza, Qasim, Hashimiyah, Ash Shumali and other smaller towns from 3rd Squadron, 73rd Cavalry of the 1st Brigade Combat Team, 82nd Airborne Division. In August 2008, 1-9th Cav was given orders to build a forward operating base (FOB) along the Iranian border in order to interdict lethal accelerants from being smuggled. The base is known as FOB Hunter and is in the Maysan province which resides in the marsh lands of Iraq. The 2nd Squadron, 9th Cavalry was stationed in Munich Germany 1963–1968. It was reassigned to Fort Riley, Kansas in 1968. During Operation Desert Storm, it served as the 24th Infantry Division's Divisional Cavalry Squadron and was based at Fort Stewart, Georgia. It was reflagged in 1996 to 3rd Squadron, 7th Cavalry when the 24th Infantry Division was reflagged to the 3rd Infantry Division. In 2003, it was reactivated at Fort Carson, Colorado as Troop B, 9th Cavalry and served as the Brigade Recon Troop for 3d Brigade, 4th Infantry Division during Operation Iraqi Freedom I. As part of the conversion to modular Brigade Combat Teams, Troop B was expanded back into an armored reconnaissance squadron for 3d Brigade. The squadron, nicknamed "Hunters," deployed in support of Operation Iraqi Freedom IV, serving in two provinces: first in Salah ad-Din near ad-Dawr, first as an attachment to the 3rd Brigade, 101st Airborne Division, and then in Diyala with the rest of the 3rd Brigade, 4th Infantry Division, after handing over the base in ad-Dawr to A "Gators" Battery, 1st Battalion, 319th Field Artillery Regiment of the 3rd BCT, 82d Airborne Division, and the Iraqi Army. The 2nd Squadron was inactivated on 18 October 2007, and reflagged as the 4th Squadron, 10th Cavalry Regiment (4-10th Cav). The 4th Squadron, 9th Cavalry, "Darkhorse" is stationed at Fort Hood, Texas and is the armored reconnaissance squadron for the 2nd Brigade Combat Team, 1st Cavalry Division. During Operation Iraqi Freedom 06-08, the Darkhorse deployed with Black Jack to Baghdad, Iraq, where it secured the International Zone—the area of central Baghdad that is home to the U.S. Embassy, Iraqi Council of Representatives, and numerous other Iraqi and Coalition governmental offices. The squadron's responsibilities were later expanded to conduct counterinsurgency operations throughout the Karkh District. In 2009 the squadron again deployed to Iraq, this time to Kirkuk Province for OIF 09-10, where it was responsible for the security, stability, and reconstruction of the Daquq district and the Taza, Laylan, and Rashaad sub-districts. The squadron partnered with the 15th Iraqi Army Brigade and Iraqi police from each of its districts to conduct area security and stability operations for an operating environment of over 3,000 square kilometers. The squadron also helped to balance ethnic tensions through the training and equipping Iraqi security forces, improvement of essential services, and the support and promotion of the legitimate government. In 2011 the squadron deployed a third time to Iraq, in support of Operation New Dawn. In 2013 the squadron deployed to Afghanistan in support of Operation Enduring Freedom. The 5th Squadron, 9th Cavalry, was reconstituted at Schofield Barracks, Hawaii, with headquarters at Wheeler Army Airfield. Its motto is "We can, we will." The unit consisted of one ground troop (A) and two air troops (B & C). Each air troop consisted of a scout platoon, flying the OH-58A+ Kiowa, and a gun platoon, flying the AH-1 Cobra. 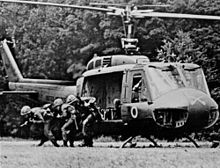 The squadron also had one UH-1 Huey. 5th Battalion, 9th Cavalry Regiment re-flagged to become 3rd Squadron, 4th Cavalry Regiment in 1996. The 6th Squadron, 9th Cavalry, is assigned to the 3rd Brigade Combat Team, 1st Cavalry Division, and is stationed at Fort Hood, Texas. 6th Squadron was built from Troop F, 3rd Brigade's Recon Troop for OIF II. The unit is nicknamed the "Saber Squadron." Coincidentally, the unit replaced the 2nd Squadron in Diyala when it deployed in October 2006 in support of Operation Iraqi Freedom 06-08, from which the last of the unit's soldiers returned on 18 December 2007. 6/9 Cav was one of the last units to have left Iraq along with the 3rd Brigade 1st Cavalry Division on 18 December 2011. 1st Squadron is actively serving as a CAB ( Combined Arms Battalion) in the 2nd Brigade, 1st Cavalry Division stationed at Fort Hood, Texas. 4th Squadron is the armored reconnaissance squadron of the 2nd Brigade, 1st Cavalry Division stationed at Fort Hood, Texas. 6th Squadron is the armored reconnaissance squadron of the 3rd Brigade, 1st Cavalry Division stationed at Fort Hood, Texas. John H. Alexander, second African American graduate of West Point (commissioned in 1887). Benjamin O. Davis, Sr., First African-American general officer in the U.S. Army. Robert Temple Emmet, Colonel of the regiment and Medal of Honor recipient. Lt. Gen. (Ret.) Paul E. Funk, Commander of A Troop 1970. Commanded 3rd Armored Division in Desert Storm. Commanding General III Corps and Fort Hood 1994–95. Capt. Jon E. Swanson – B Troop 1-9 Air Cavalry 1971. The only OH-6A pilot recipient of the Medal of Honor. Charles Young, third African American graduate of West Point (commissioned in 1889). ^ At the same time, Lt. Gen. William T. Sherman, commanding the Military Division of the Mississippi, was directed to form one regiment of colored regulars to be designated the 10th Regiment U.S. Cavalry. ^ a b c d e Schubert, Frank N. (1997). Black Valor: Buffalo Soldiers and the Medal of Honor, 1870-1898. Scholarly Resources Inc. pp. 9–25. ISBN 9780842025867. ^ Schubert, Frank N. (1997). Black Valor: Buffalo Soldiers and the Medal of Honor, 1870-1898. Scholarly Resources Inc. pp. 41–42. ISBN 9780842025867. ^ Schubert, Frank N. (1997). Black Valor: Buffalo Soldiers and the Medal of Honor, 1870-1898. Scholarly Resources Inc. pp. 121–132. ISBN 9780842025867. ^ Buckley, Gail Lumet (2002). American Patriots: The Story of Blacks in the Military from the Revolution to Desert Storm. Random House Trade Paperbacks. ISBN 978-0-375-76009-9. ^ Pike, John. "1st Squadron, 9th Cavalry Regiment". Retrieved 2017-10-28. ^ a b "Article on 1st Squadron, 9th Cavalry". Globalsecurity.org. Retrieved 29 August 2012. ^ "Last Brigade Leaves Iraq". U.S. Army. U.S. Army. Retrieved 31 March 2016. ^ "Lt. Gen. Paul E. Funk, USA (RET.)" (PDF). W.R. Poage Legislative Library. Baylor University. Retrieved 6 February 2014. ^ "1st Squadron, 9th Cavalry". Archived from the original on 22 February 2014. Wikimedia Commons has media related to 9th Cavalry Regiment (United States). This page was last edited on 15 February 2019, at 15:52 (UTC).